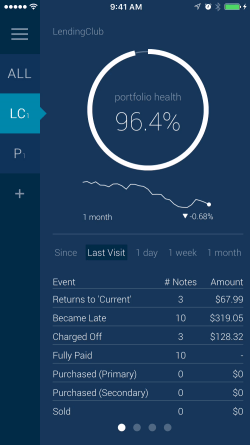 When we released our mobile application, LendingRobot Dashboard, many users might have noticed that the first screen to appear after logging in displays your portfolio’s health. In this article, we’ll give an explanation of portfolio health, how it is calculated, and its potential use in gauging portfolio performance. We consider Lending Club as our example platform. Where \(n\) is the number of ongoing (not paid or charged off) notes in the portfolio, \(Note \space Health\) is the individual health of note \(i\), and \(\omega\) is a weight calculated as the remaining outstanding principal for note \(i\) divided by the portfolio’s total remaining outstanding principal. Notice in the equation that if a note is 0 days late then it has a health of 100% whereas if it is 120 days late it has a health of 0%. The note health decreases linearly as days late increases from 0 to 120. Also, it is possible for notes to be more than 120 days late when they have the status of default but have not charged off yet; we count them as being 120 days late and having 0% note health. The portfolio health in this case is 97.5%; exactly the same as the sole note’s weight-adjusted health. This is because the entire portfolio is comprised of that single note. The portfolio health for this portfolio is 46.25%, the sum of the weight-adjusted health column excluding N/A values. Again, our process is finding every ongoing note’s health, weighting the note health by its weight based on remaining outstanding principal, and summing up the resulting weight-adjusted healths. Again, note that notes 5 and 6 are not included in the portfolio health calculation because they are not ongoing notes. In this case, we have an expected portfolio health of 74.94%. We can see that our example portfolio’s health (46.25%) is worse than expected, and is largely due to notes 3 and 4 where the actual days late are much greater than expected. This could be an indication that whatever rule or investment strategy that is picking 36 term G3 and C4 notes might warrant reconsideration. Thus, we believe portfolio health has potential in gauging your portfolio and investment strategy performance. What is considered average for portfolio health? Would help to determine if things are ok, or if changes are needed. Maybe even have a breakdown by number of notes carried. Portfolio Health is investor-specific based on the grade and term of notes you carry. These numbers are for descriptive purposes only. Our original intent was to show what the average or comparable portfolio’s health was. Unfortunately we do not currently have the data granularity necessary to show the comparison portfolio’s health with decent accuracy.